Regina José Galindo: "Guatemala is violent, and so is my art"
Indonesian artist Samuel Indratma likes to work with scrap iron. During the exhibition Agro Metal in the Tembi Contemporary gallery in Jogjakarta, May and June 2009, his recent work was on display. Tembi Contemporary was built after the 2006 earthquake and it is now a place where the community can develop its skills, especially in art and culture.meeting point for the locals. Tembi works together with other galleries in South-East Asia, like Manila Contemporary, Valentine Willie Fine Art (Singapore) and Valentine Willie Fine Art (Kuala Lumpur). "Agro Metal is a reflection of my work in public space", says Indratma. "Some parts can even be used as signage." He made a large Javanese alphabet for a kampong, where people can make drawings on. "It is important that the audience can respond to a object. That way it is o longer standing on its own, but it becomes part of public activity", he says. Samuel Indratma is also known as the 'fresco president', an honorary title he became from his friends for his activities in that field over the last ten years. In 2002 Samuel started working on a mural, together with Apotik Komik, a group that paints comic strip characters on the columns of the Lempuyangan pedestrial bridge. This started a genuine mural epidemic in cities like Jakarta, Bandung, Semarang and Surabaya. "I think citizens have the right to enjoy public space, and that it should not be used for commercial advertising only", says Indratma. 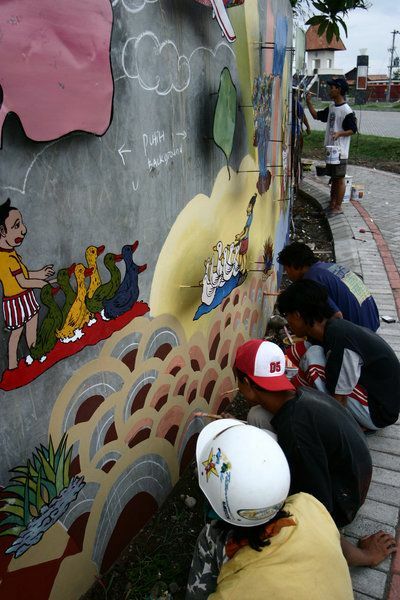 Under the name Jogja Mural Forum, Indratma organized in 2008 mural teams in five kampongs in South-Jogjakarta, consisting of artists and locals. The paintings were created collectively. The mayority was based on local issues, like education and health care, but always depicted with a comical angle.